Shawn Jones, M.D., fourth from left, a Paducah otolaryngologist who was presented with the KMA Distinguished Service Award Saturday night, complimented the Middlesboro students who worked to get a smoking ban passed and were recognized with the KMA Debra K. Best Outstanding Layperson Award. Pictured with Dr. Jones are teachers Tonya Martin, left, and Kelsey Massengill, right, and students Haylee Mills, Chloe Burchett, Ryann Tong, Sabrina Sparks and Kaylea Martin. Photo by David Knapp for KMA. 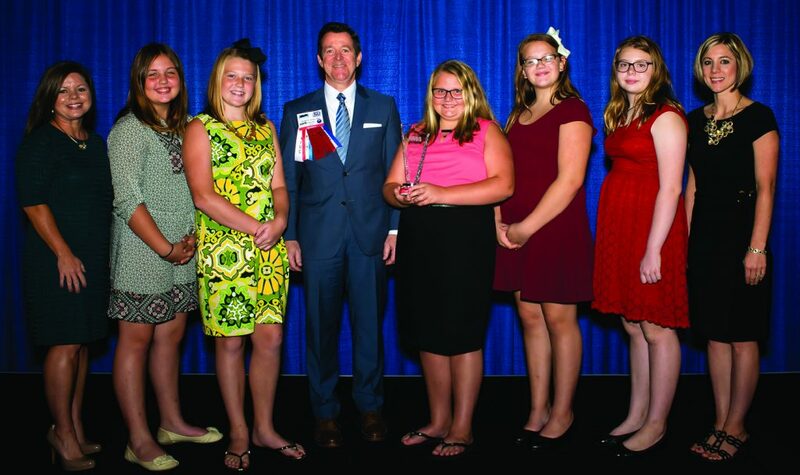 As they walked to the stage to talk about their efforts to implement a public smoking ban in their community, five young girls, their teachers and principal from Middlesboro received a standing ovation from the physicians in attendance at the Kentucky Medical Association Annual Meeting Saturday, Sept. 10. The girls were part of the 2014 Destination Imagination Team from Middlesboro Elementary School that worked with the Middlesboro City Council to adopt the public smoking ban. Team members were Bryce Bowling, Chloe Burchett, Kaylea Martin, Haylee Mills, Sabrina Sparks, Ryann Tong and Jack Yoakum. Their coaches were Kelsey Massengill and Tonya Martin of Middlesboro Elementary School. Smoking is the leading preventable cause of death in the U.S. The Centers for Disease Control and Prevention stresses there is no risk-free level of secondhand smoke exposure; even brief exposure can be harmful to health. For the past year, the Kentucky Medical Association and its charitable arm, the Kentucky Foundation for Medical Care, have joined with other stakeholders for its Commit to Quit smoking cessation campaign. KMA has lobbied for a statewide smoking ban during the most recent legislative sessions. Shawn Jones, M.D., a Paducah otolaryngologist, has been a leader in that effort and the face of the campaign. He also will be heading up the KMA LEED initiative stressing Leadership through Education, Experience and Development. He applauded the efforts of the students and said they set an example of strong leadership and caring for their community. “If fourth graders can get a major public health ordinance passed in their community, imagine what a highly trained and articulate physician could do,” Dr. Jones said. Students attending the KMA Annual Meeting told the physicians how their project came together. Chloe Burchett said she didn’t like when her brother, who has asthma, had to walk through the smoke just to go into a local business. “After researching our county statistics, we realized it was a much bigger problem,” she said. The students had to create a project brand with logo and jingle, and include a puzzle. It wasn’t easy to get the smoking ban passed, and their first trip to City Hall was not successful. But the students persisted and collected 408 signatures on a petition. The team was successful in its second trip to the council. The ordinance took effect Aug. 24, 2015. Physicians at the KMA Annual Meeting were impressed with their efforts. The team received another standing ovation when they were called to the stage by KMA President Ted Miller, M.D., PhD, to receive the Debra K. Best Outstanding Layperson Award Saturday night. Principal Anthony Maxwell, EdD, credited the students with sticking with a project that he thought would be controversial. The accolades they have received, including the KMA award Saturday, showed they can make a difference.